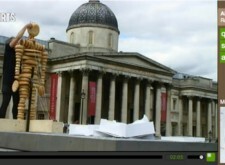 One & Other was an ambitious art project conceived by world-famous UK sculptor Antony Gormley that aimed to create a living portrait of the UK by “elevating the human” and putting 2,400 people from all over the UK on the fourth plinth in Trafalgar Square for one hour each, 24 hours a day for 100 days. Headshift managed all aspects of the online side of the project, from building an online application to find and select ‘plinthers’ from the tens of thousands who applied, through to designing and creating a formidable web presence for the project, including a 24/7 high-quality live video feed. The project was a huge success. 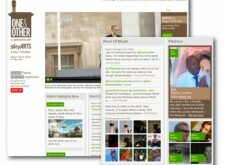 The website had 2.5 million visits, over 8 million pageviews and tens of thousands of comments in under 4 months, with several decades worth of video footage streamed and a whole sub-culture emerging around the project on Flickr, Twitter and the web – some of it surviving the project’s own lifetime. Antony Gormley and Sky Arts needed a website to support the One and Other project that met their exacting technical demands, matched the project’s artistic conception and, above all, ‘elevated the human’, providing a web experience that centred around the person on the plinth and allowed them to come through as themselves, or whatever else they wanted to be. With the entire UK as potential participants we built a competition engine that would randomly select an equal spread of 2,400 men and women across all regions of the UK from the 34,520 people who applied to the site. To engage the nationwide spectrum of potential participants we created a blogging platform for viewer involvement, in order to form connections and communities and foster wider user participation around those with places on the plinth. The site was built in an agile, test-driven manner using a variety of technologies, including the Movable Type blogging platform and a bespoke solution using Ruby on Rails. We were involved in all aspects of the technical production; transporting and encoding video, managing the hosting environment and designing a standards-complaint, accessible XHTML front-end. As an artistic project, our approach to requirements-gathering had to be extremely rigorous and sensitive, ensuring that the client’s wishes were reflected in every detail of the finished project. We watched with surprise and excitement as connections grew and a sub-culture formed around the #oneandother Twitter hashtag and elsewhere on the web and resisted the temptation to assimilate the naturally-occurring conversation into the site, instead joining in the conversation with people who were obviously as struck by the sheer humanity of the project as we were. The site now continues as an archive of the video, comments, blog posts and profiles of those who took part, and will also be permanently mirrored within the British Library. See also our collection of links to coverage of the project on other sites.